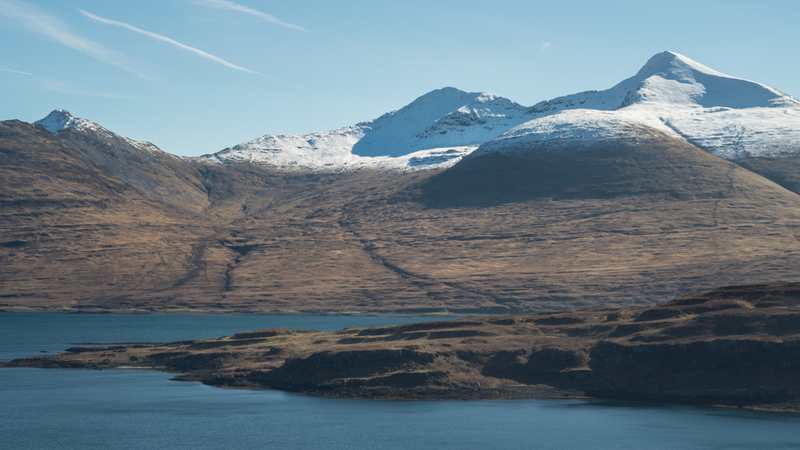 As the highest point on the Isle of Mull, and Scotland’s only Munro that is accessible only by boat, a walk up Ben More is often on the ‘to do’ list for visitors to the island. 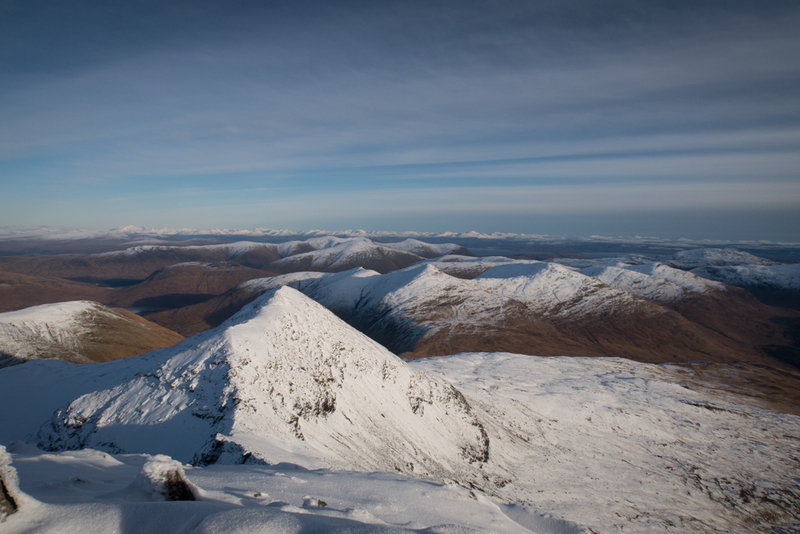 At 966 meters in height, Ben More towers over the island’s other hills. Not only do you get a stunning, 360-degree view, but you also get the acute sense of altitude that this sort of elevation creates. 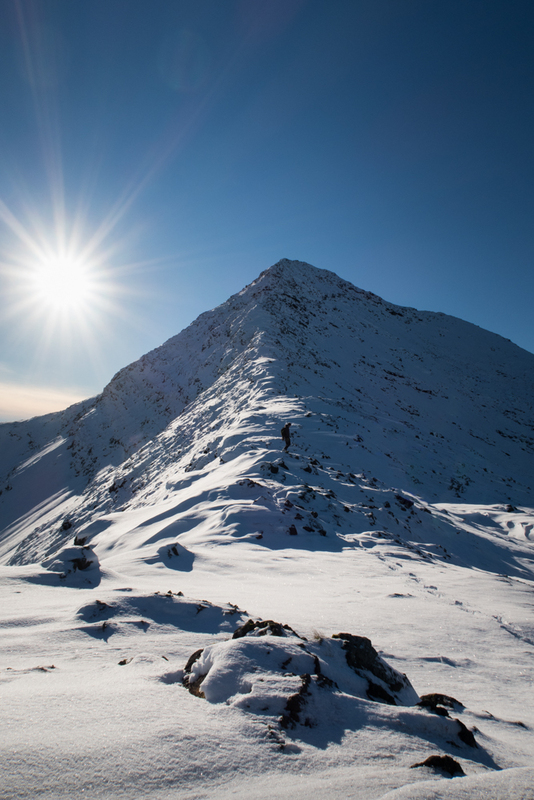 With no neighbouring mountains of comparable height, Ben More really does feel like the highest point around! 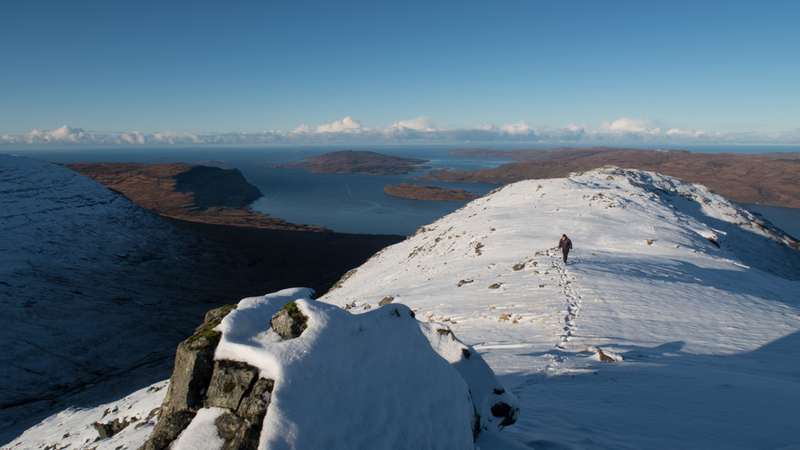 The simplest route to the summit starts on the shore of Loch na Keal at Dhiseig. From here a marked path leads up the broad flank of the hill to the circular summit cairn. Simple. 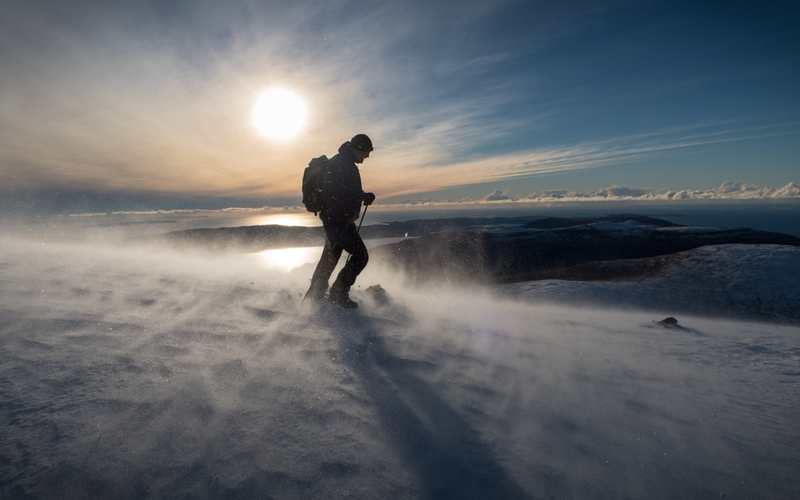 To experience our island Munro at its most dramatic though, arguably the best route is a circular traverse of Beinn Fhada to A’Chioch and then along the ridge to Ben More. 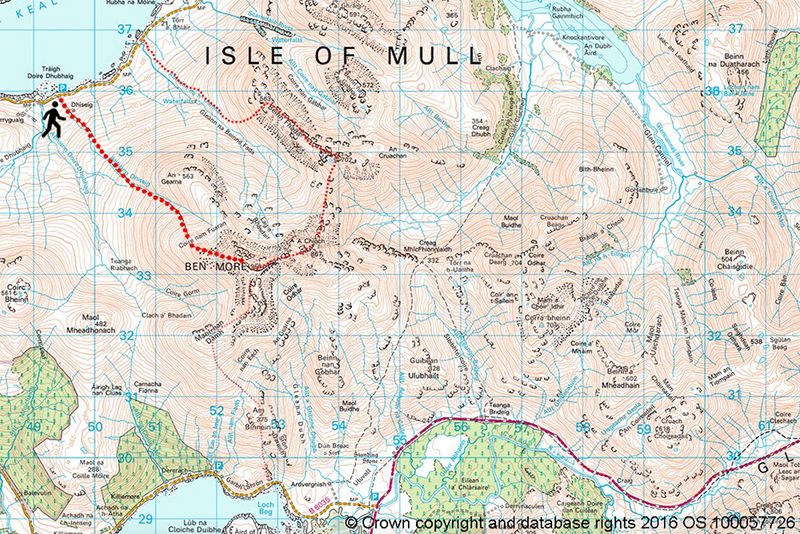 This route involves some scrambling (see the map below). 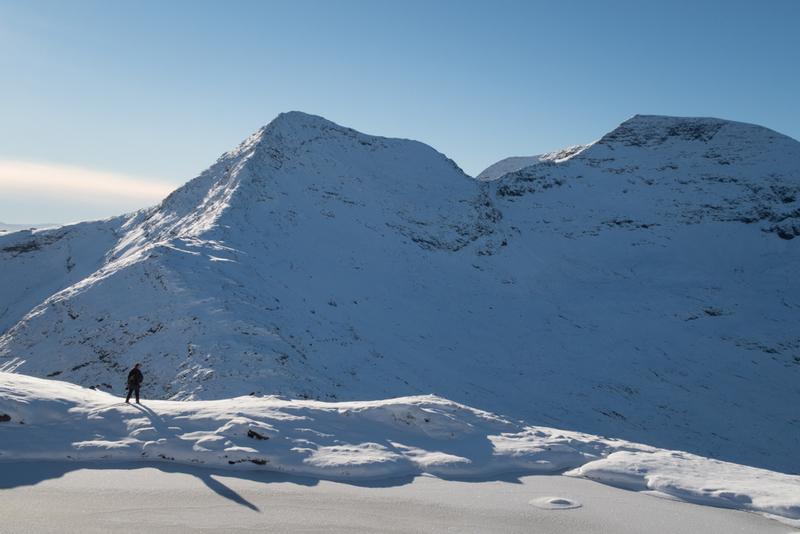 Let’s take a look at this route as it was on a fine winter’s day! Having parked the car off the road along the shore of Loch na Keal, we began the walk by following the burn (Abhainn na h-Uamha), which has a series of spectacular waterfalls along its course. 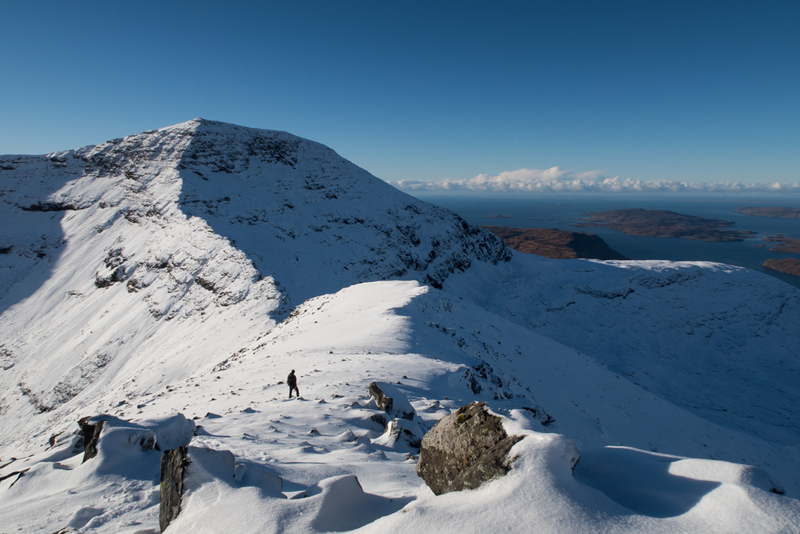 Feeling lucky that we had chosen such a clear, crisp day, we then headed uphill to crest the ridge of Beinn Fhada. At this point the views are just incredible. Looking back you can see the curve of the Gribun cliffs, the islands of Ulva and Eorsa, Staffa, and the Treshnish Isles. Up ahead, Ben More and the ridge look really inviting. After a short sharp climb to the summit of Beinn Fhada (702m), with jelly babies providing the extra fuel we needed, we headed west and began the climb of A’Chioch (867m). 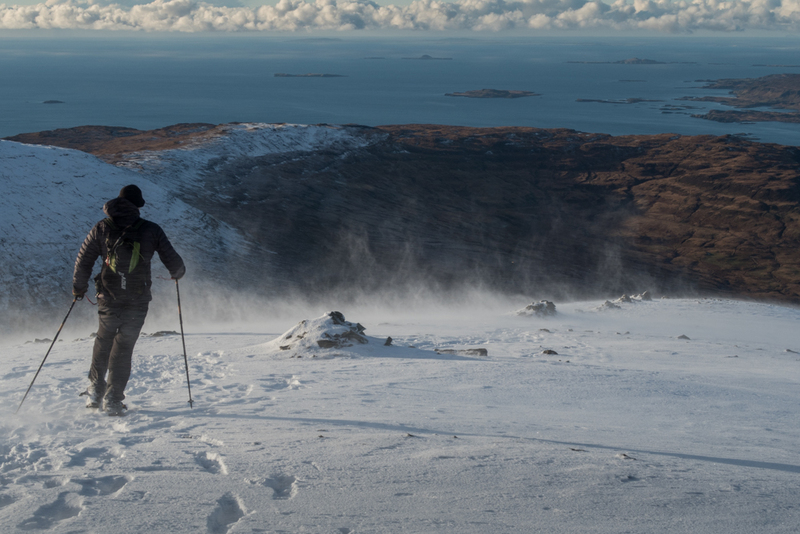 The views here are superb, and picking our way up towards the summit through snow drifts was great fun! 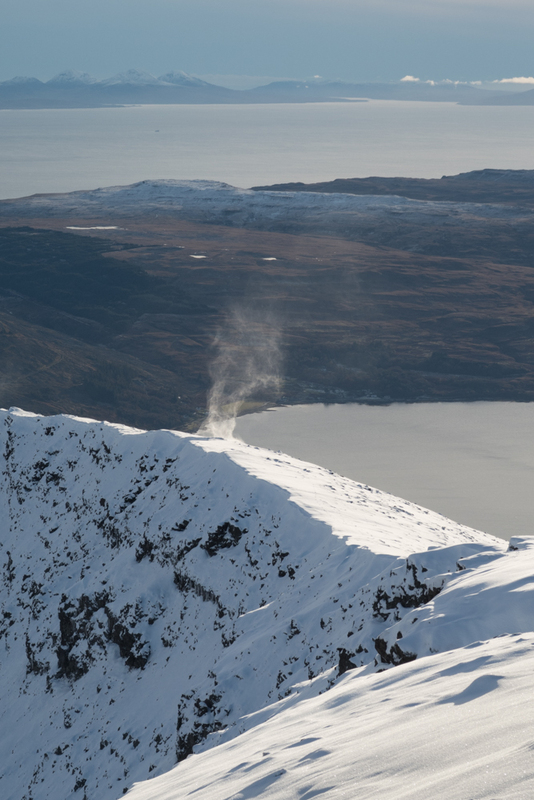 We were lucky that the winds weren’t strong at this point, so we were able to enjoy settled conditions and sunshine. 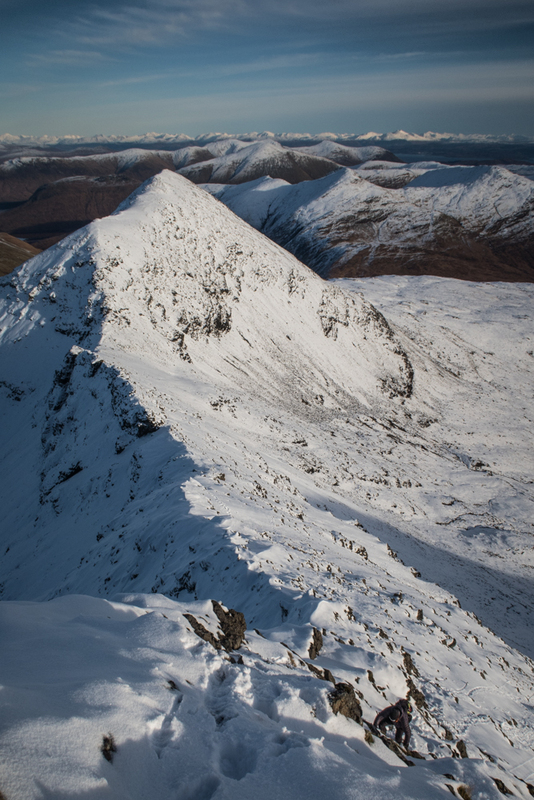 The final traverse over the ridge to Ben More was relatively straightforward, though the final section involves some scrambling. Just at the point where your legs are starting to ask for a rest, the ridge narrows to just a few meters wide and has significant drops on both sides, which help sharpen the senses! We finished the walk feeling battered but not broken. 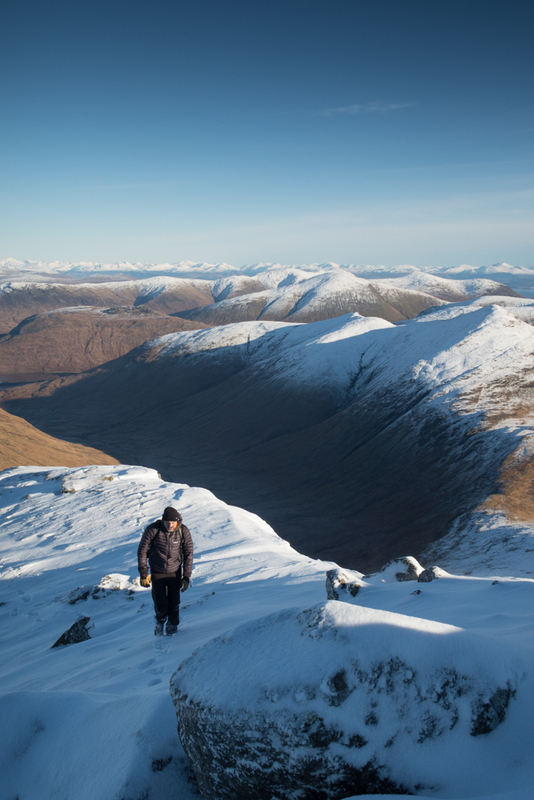 No matter which time of year or by which route you choose to climb Ben More, it is always a memorable experience and well worth the effort. Note: Hill walking has inherent risks and dangers. 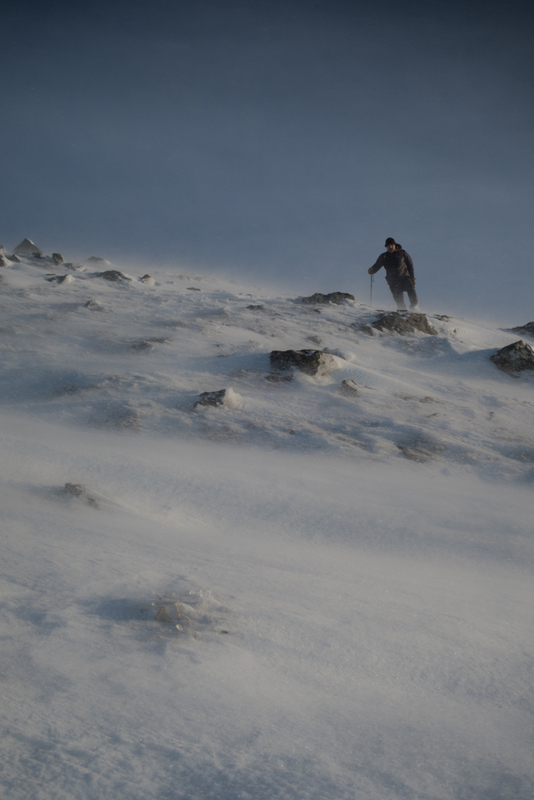 Conditions change quickly and navigation can be difficult. 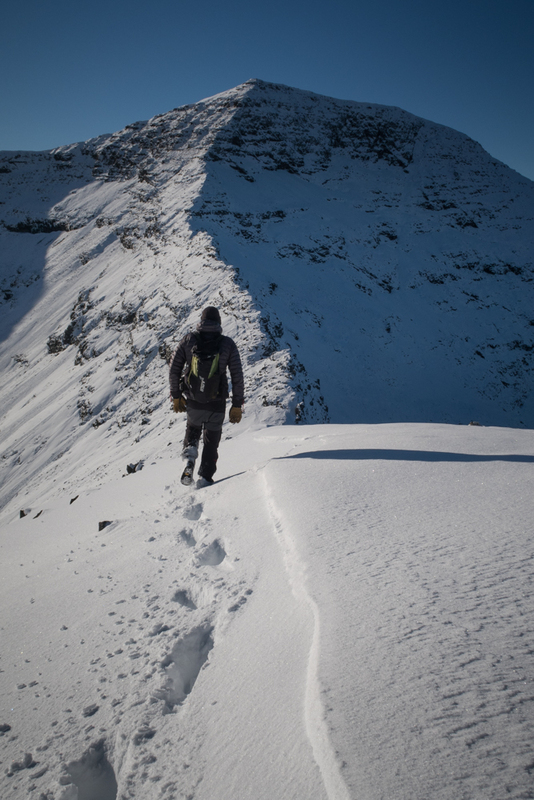 Always make sure you are well prepared for any conditions and have the correct level of experience for your chosen route.